Come join us Tuesday nights for Laughter, Fun, Friends & Great Prizes. Quiz Night is as old as the Pub and still going strong 11 years later! First Prize is a $100 BAR TAB, Second is a $50 BAR TAB!! Without doubt the best quiz and the best rewards for your knowledge in town!! Hosted By Quizmaster Extraordinaire, Dallas!! 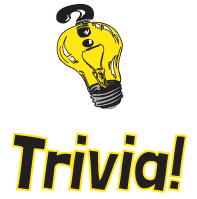 PS - O'Hara's Red Ale 20oz Draught is ONLY $4 ALL DAY on Tuesday, Quiz Night! 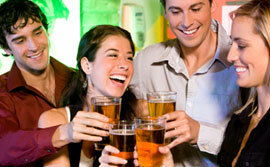 These days it pays to have a good time at McMullan's Irish Pub! Next time you're in the Pub, be sure and sign up and start earning points! 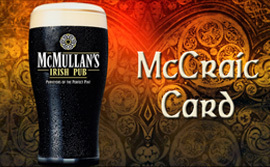 We credit your McCraic Card with points for every dollar you spend. Redeem your points for menu items and merchandise at the Pub! We will also have special discounts from time to time on certain items! Ask your Server or Bartender for an application form next time you're in, so you can start earning points!